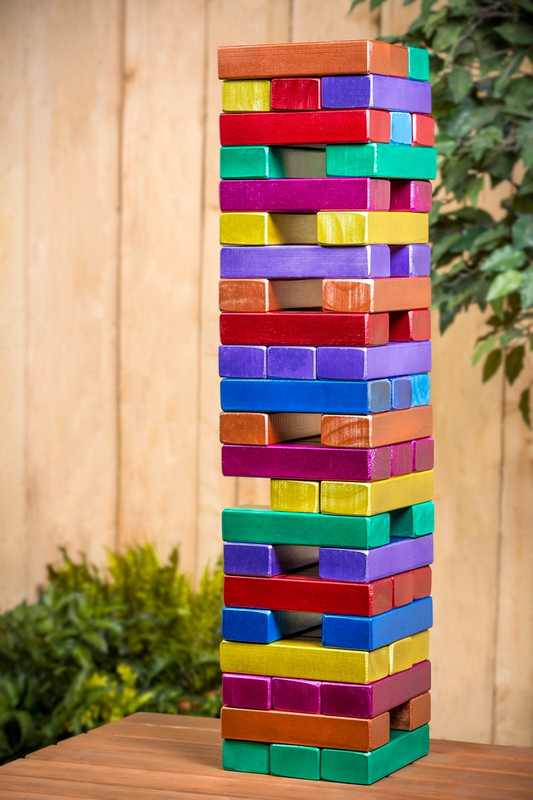 Create a bright and vibrant larger-than-life Jenga set using Krylon®! Use a miter saw to cut 54 pieces from eight 2X4 boards of wood. The final cut pieces should measure 10.5 inches in length, so when marking the board with a pencil to indicate cut marks, add a bit of additional length to account for trimming with the saw. Sand each piece of wood with medium grit sandpaper to ensure the surface is smooth and free of splinters. Use a tack cloth to remove any dust and debris. Prepare an area to spray paint by placing a drop cloth on a flat surface in a well-ventilated area free of dust and debris. Set the wood pieces on the drop cloth far enough apart from one another to avoid overspray. It is easiest to paint the pieces if they are vertically standing on one of the shorter edges (envision setting up a game of dominos). After reading product label for proper application and safety instructions, begin to spray each group of blocks using a different color from the Krylon® Shimmer Metallic Candy Color Collection. Wait until paint is completely dry before flipping the pieces to paint the bottom surface on which the pieces were originally standing. Allow paint to fully dry before use.